A hall filled with beds, beeping equipment and a whole lot of Band-Aids greeted students at Durham Academy on Wednesday, Oct. 24. 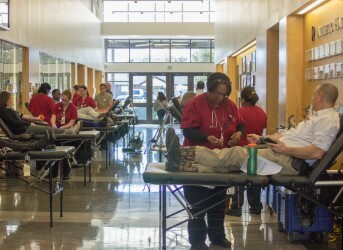 This year’s student-led blood drive was an enormous success, with a record-breaking high of 75 pints of blood that will go on to help save hundreds of lives. William Edwards, an Upper School science teacher and a regular at the biannual drives, echoes that message: “Every time I donate blood, I feel that I have done something good and worthwhile that will serve as a benefit for someone in need.” Mr. Edwards shares his story that it was his dad who “donated blood on a regular basis,” and it was this example of bravery that led him to “first [begin] donating blood when [he] was in college." He has continued to donate ever since. With the constant need for blood, the club has big plans for the future. Mr. Ross hopes to make the blood drive an event not just for Durham Academy but for the larger community and to get more parents and other community members involved. More importantly, he wants to change the culture, and he expresses his hopes to change “perceptions of blood donation to the point where students are excited to turn 16 because that will mean they can start donating.” With plans to hold another drive in the spring, the Red Cross Club pushes forward with high hopes in hand. 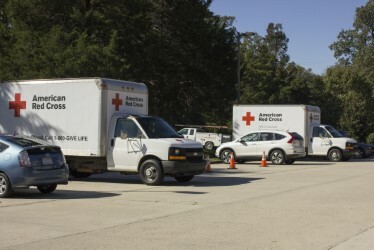 Learn more about what happens to donated blood at https://rdcrss.org.